Harvard geochemist Charles Langmuir is an expert on undersea volcanic vents. Looking at the planet as a complex system of moving minerals, changing gases, and blooming life, he sees the geological evolution of Earth as the natural progression that is now being shaped by human activity. In an article in Harvard Gazette he speculates on the future geological stages our planet might go through as human impact increases. Like other recent geologists (see Mineral Evolution) he understands that life is a geological force shaping the landscape and composition of the planet. And like others he believes that humans-plus-technology is becoming a geologic force. Planets may proceed through a natural series of evolutionary steps that transform them from lifeless balls into the home of bacteria and other microscopic life and then into a place that supports more complex life. Along the way, life interacts with the nonliving parts of the planet in planet-changing ways there’s no guarantee that a planet will proceed from one to the next. Each step represents a moment of both crisis and opportunity. Some geologists believe human impact on the planet is so strong it warrants viewing this period of time now as the dawn of the Anthropocene — the geological period after the Holocene. The Holocene is defined as the post-glacial geological epoch during the advent of human civilization, the period of time marked by the force of agriculture on the land and atmosphere. But unlike the Holocene, the Anthropocene is marked by the effects of industry, mass consumption, heavy urbanization, and human-led species lost. Since the start of the Industrial Revolution, Earth has endured changes sufficient to leave a global stratigraphic signature distinct from that of the Holocene or of previous Pleistocene interglacial phases, encompassing novel biotic, sedimentary, and geochemical change. These changes, although likely only in their initial phases, are sufficiently distinct and robustly established for suggestions of a Holocene–Anthropocene boundary in the recent historical past to be geologically reasonable. According to Nobelist Paul Crutzen, who coined the term Anthropocene, a reasonable metric to mark the dawn of this epoch is by the current elevation of CO2. The problem with that is of course that it has elevated for other reasons in the past so it is not a singular metric. Two other potential metrics are changes in the ratio of carbon isotopes due to increased anthropogenic carbon, and the global spread of radioactive isotopes from atom bomb testing. To assign a more specific date to the onset of the “anthropocene” seems somewhat arbitrary, but we propose the latter part of the 18th century, although we are aware that alternative proposals can be made (some may even want to include the entire holocene). However, we choose this date because, during the past two centuries, the global effects of human activities have become clearly noticeable. This is the period when data retrieved from glacial ice cores show the beginning of a growth in the atmospheric concentrations of several ‘greenhouse gases”, in particular C02 and CH4. Such a starting date also coincides with James Watt’s invention of the steam engine in 1784. About at that time, biotic assemblages in most lakes began to show large changes. 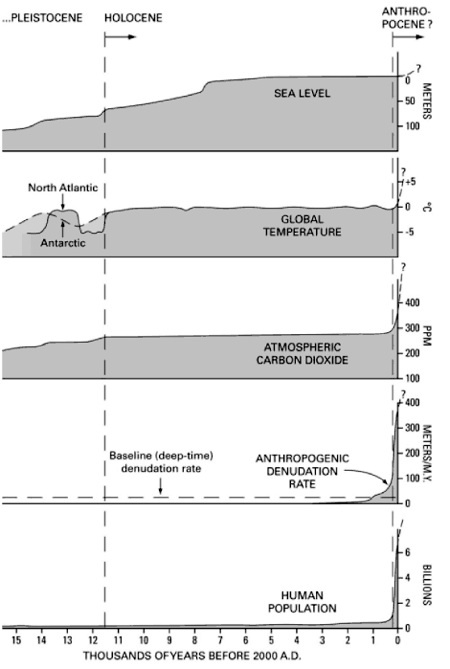 The levels that characterize the start of the Holocene 10,000 years ago have been relatively level for the past 5,000 years, but now (as the chart above shows), in the last few hundred years a new set of risinging levels have appeared. 30-50% of the land surface has been transformed by human action; more nitrogen is now fixed synthetically and applied as fertilizers in agriculture than fixed naturally in all terrestrial ecosystems; the escape into the atmosphere of NO from fossil fuel and biomass combustion likewise is larger than the natural inputs, giving rise to photochemical ozone (‘smog’) formation in extensive regions of the world. A close up view of the Anthropocene may be seen in this mosaic of graphs below from Global Change and the Earth System (PDF). (Individually the graphs should be accepted with caution since some are based on actual data and others on computer models.) 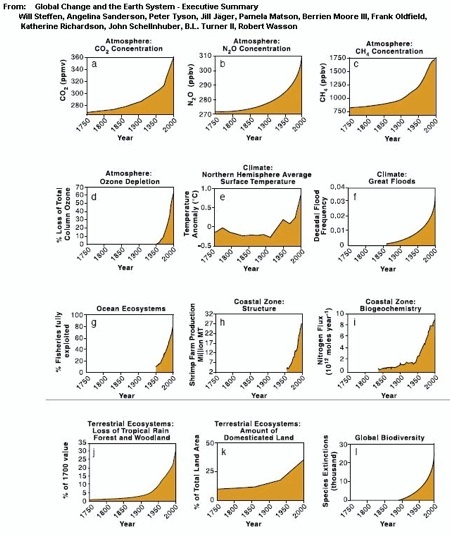 But they do give a sense of the general scale of change on global attributes. Human degradation of the environment has the potential to stall an ongoing process of planetary evolution, and even rewind the evolutionary clock to leave the planet habitable only by the bacteria that dominated billions of years of Earth’s history. The Earth today may be at the brink of another step. Complex life has evolved into intelligent life that dominates the planet — ecosystems, food webs, and energy flow — as no species ever has before. Whether the planet takes the next step or not may depend on us. …Mankind will remain a major geological force for many millennia, maybe millions of years, to come. To develop a world-wide accepted strategy leading to sustainability of ecosystems against human induced stresses will be one of the great future tasks of mankind, requiring intensive research efforts and wise application of the knowledge thus acquired in the noösphere, better known as knowledge or information society. Technology is shaping not just our lives, but also our world. If the technium continues to expand it will become the largest geological force at work on the geosphere, atmosphere and biosphere combined. It is becoming not just a human force, not just a civilizational force, but a planetary force. I stomped on a bacterial mat until it fessed up. This is all a scam! They just bred us for food! They’re a big hive-mind or something and they’ve made suckers out of all of us! Not only that but there sick of how we taste… too many trans-fats and nitrates. So they’re planning to wipe us out and bring back the jellyfish. Keep posting with more new information…. These results are correct, regardless of whether the significance of his existence. I believe louis vuitton monogram theda gm there will make you satisfied results. The assumption, of course, is that life as we know it will need to continue. But we know that a major biological innovation, photosynthesis evolved billions of years ago and changed the planetary geology and biology. What if the anthropocene is characterized by a similar major change, perhaps to a purely technological ecosystem, forcing existing life back into niche environments? Mind residing in artificial systems would certainly dominate the solar system and also the earth, usurping the current dominant position of living systems. Excellent essay; however, I have to challenge the idea that humans could so harm the Earth as to render it uninhabitable to all but bacteria. The Technium is driving the environmental change, human culture drives the Technium, and humans drive human culture. It won’t take too much environmental damage to destroy human culture and, therefore, the Technium. It is fairly likely humans would survive the end of human civilization, and highly-likely that complex life would survive. The Earth would be given a set back, on the order of a mass extinction of technological life, human culture, and biodiversity; however, the biodiversity would certainly quickly return within a few million years–the blink of an eye when speaking in terms of epochs. If humans survive, the culture would return within a few thousand years, and with them a new Technium. if The Technium is to “become the largest geological force at work on the geosphere, atmosphere and biosphere combined,” what is to distinguish it from the geo/atmo/biosphere? I understand this is a matter of ontology, but if The Technium is largely influencing the geo/atmo/biosphere and there’s no feedback, doesn’t the geo/atmo/biosphere effectively become [part of] The Technium? Kevin, this feels like an argument against Jan Zalasiewicz — who (if I’ve got him right) claims that the earth’s crust will get scraped clean of our traces in short order, and yes, markers will remain, but more as subtle signals and less as geological boundary-markers. I’d love to see, just to complete the picture, a line-up of geological indicators that humans *haven’t* yet budged. For instance, even though we are so spread out and so active, I feel like we don’t actually move much matter, at least in planet-scale terms. I feel like 10,000 years of human civilization has reshuffled as much of the crust as, say, a year or two of some minor tectonic plate’s glacial nudging. Now of course, that kind of an indicator has less bearing on the earth’s thin ecosystem than, say, our contribution to CO2 levels — but even so, I’d be curious to know some of the ways the earth *hasn’t* yet changed. Sometime when I was much younger I read someone comparing the human race to the yeasts in a champagne bottle. I can’t find any reference to tell me who might have first said it (for all I know it’s on page 93 of some Vonnegut book I read in high school). The idea is that yeast consume the sugars in the bottled-up grape juice until there’s not much sugar left and a poisonously high level of alcohol, and all of them die. Now, I did some googling and some calculating and came up with a rough figure, that if we were the size of yeast cells, a regular champagne bottle would be 125 miles long. The size of Connecticut, give or take a little. The whole world has a surface area about 35,000 times larger, which seems like a huge difference, but to a rapidly expanding population it’s only a few orders of magnitude. It only takes a little longer to fill up, really. I guess where I’m going with all this is that it looks like the anthropocene will be a really short geological age; something will come after, the post-anthropocene. Could look like Life After Man. Could look like Amish World. Could look like Computronium Earth. Could look like New Hadean, with nothing beyond single-celled life once again. Could look like right after the K-T boundary. But look out your window. It won’t look like that. As a geologist, having a term like ‘Anthropocene’ has practical value. Instead of having to write papers with the phrase “pre-anthropogenic influence”, I could simply write “pre-Anthropocene” (when studying a river system, for example). But, the problem then arises of where exactly to put the boundary … while some would put it around the start of the industrial revolution, others put it much earlier, when we started changing land use patterns. But, most of all I think right now it’s the discussion itself that has value rather than actually deciding on the nuts and bolts. Just as a thin layer of iridium defines the K-T boundary, I wonder if the defining feature of the Holocene-Anthropocene (H-A) boundary will be a very thin layer of plastic? @Don: That’s a good bet.